Weddings epitomize the essence of a culture, where traditions being followed since time immemorial inculcate a sense of connection to one’s roots. Each ritual and ceremony is a unique way to bless the couple, where families come together to celebrate the union of holy matrimony. India is a melting pot of traditions, some of which are remnants of thousands of years of old practices. Even if their religion is the same, traditions vary from family to family, and state to state, making India an immensely culturally diversified country. One thing which can be termed common for all Indian marriages is the high amount of importance a wedding affair is given. Being similar in nature, Marwari and Sindhi cultures have quite a few traditions which effortlessly match. Every function is a reflection of their revered traditions. As wedding planners, staying true to this part is the most essential part of the job. A Marwari wedding, managed by Tamarind Global, stands out due to its majestic splendour in Udaipur, a popular city for destination weddings. 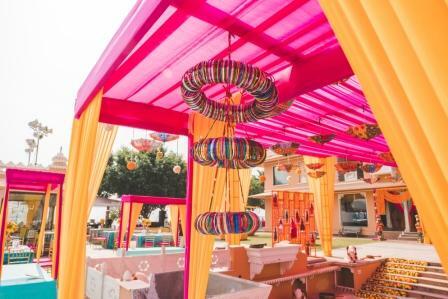 It was a massive production with multiple venues and complicated movements spread across different themes So, from a dreamlike Sufi theme to a Mehendi function inspired by Nathdwara with a central Shrinathji sculpture was kept in the centre for blessings – all details were carefully crafted to add more charm to the wedding. 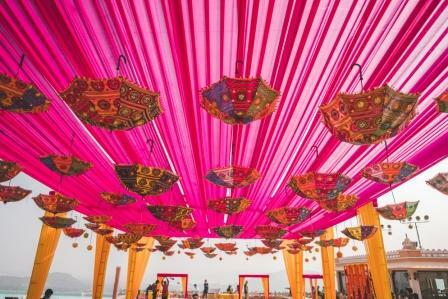 Each theme was constructed to delight the guests highlighting the importance of such factors in a Marwari wedding. It was a successfully executed big fat Marwari wedding. As wedding planners, we get all sorts of demands which range from curious to unrealistic. In one such interesting wedding that we executed, a Gujarati client requested that apart from the usual wedding related affairs, they wanted an aura of blessings to be central during each function. It was decided that some sort of music or chant, nothing too loud, would always play in the background during rituals. As expected of a big fat Gujarati wedding, there was a lot of garba, music, dance and fun. But we decided to raise the bar by doing a live Ganga Aarti as the wedding ceremony took place. 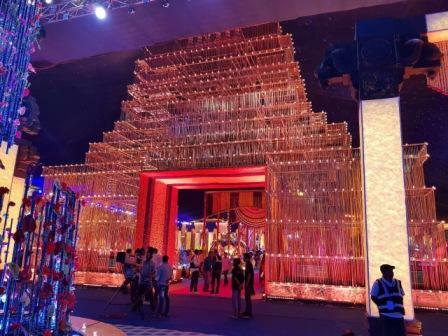 Decked with ethnic décor and surrounded by the grandeur of celebrations comprised of music and dance, the new beginning for the happy couple was showered with blessings straight from the Gods. The wedding came full circle when mother-in-law pulled the groom’s nose to welcome him into the family like a son, which is an age old tradition among Gujaratis. If it was a Marathi wedding, then the brother-in-law would have pulled the ear of the groom as a warning to take care of his sister. Different traditions here express the same emotion:- love. Many people have this belief that South Indian weddings are usually very sober and strict affairs without a lot of room for creativity. Anyone who has ever attended, or executed, a south Indian wedding knows how wrong this idea is. The essence of a wedding is to celebrate the union of two people and families in the presence of their loved ones. A Hyderabadi wedding managed to imbue the cultures of two most popular destinations- Mysore – for the royalty and Tirupati for its religious importance. It embodied the ethnic and cultural traditions that are typical to a South Indian wedding. It was a 6 hour long ceremony with multiple rituals with the bride changing her attire for different customs during the function. It was a very different experience from a typical destination wedding as each custom in itself had a lot of scope for creativity. 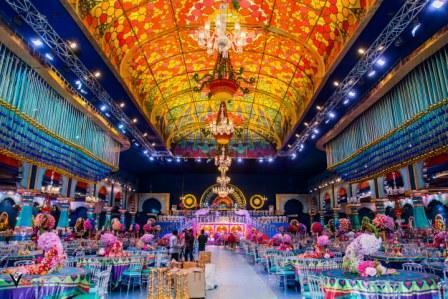 Planned and executed as a royal splendour, the wedding was an elegantly grand and elaborate affair with beautiful floral decorations such as lotus motifs, with the dinner set-up inspired by Tirupati and Mysore palace. With rapid urbanisation, India is witnessing a rise in multi-cultural weddings as the bonds of casteism and religious intolerance break down. This adds another layer of depth when it comes to planning a wedding. A marriage is also a union of two families, which is why when it comes to a fusion wedding it is important that no culture is slighted in any way. 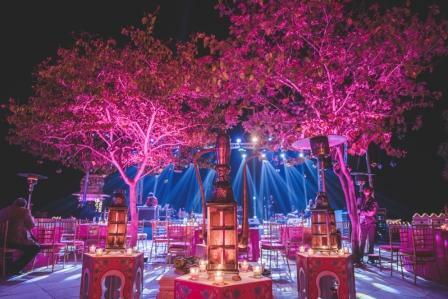 Most of the weddings executed by Tamarind Global across 30+ exotic destinations have been fusion weddings. Each time, it presents unique challenges which adds another level of experience and expertise in our portfolio. For a long time, fusion marriages have been trending as they generally tend to amalgamate rituals (and fun activities) from other cultures. For example, it is not unusual to see the practice of stealing the groom’s shoes by the bride’s sisters, even though it is a Punjabi custom and neither side of the family is Punjabi! Lavish weddings are not new to India, and considering the love for weddings that we as Indians have big fat weddings will only get fatter. It is how the traditions are respected that helps to elevate the quality of a wedding event.